Make this project by hand or machine. There are lots of new directions. 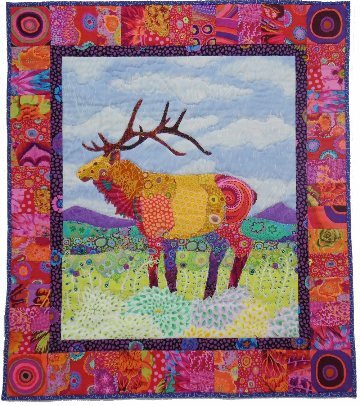 This 30" X 34" wallhanging could be created with wild and bright fabrics or in softer, realistic batiks. 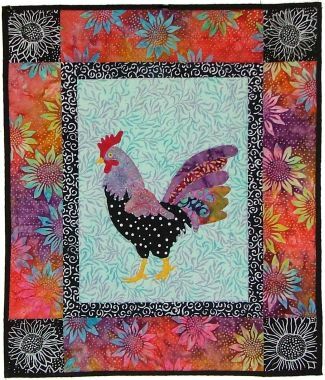 The Rooster pattern is 20" X 23". This runner is 22" X 51" and includes the see thru foundation papers for the project. 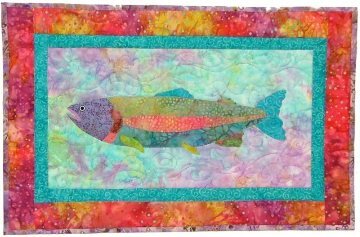 The Wedding Ring Table Runner is 22" X 51" . 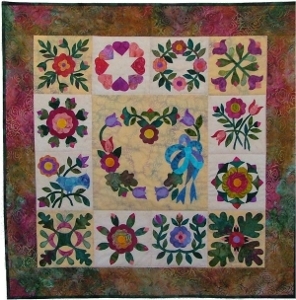 A pattern as well as acrylic templates are available. 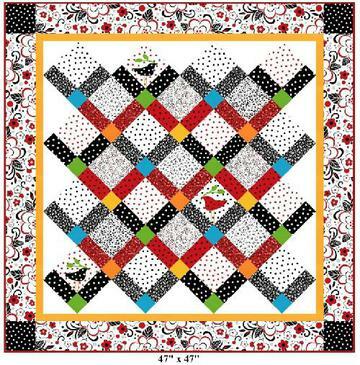 Make this 35" flannel receiving blanket and use the leftover scrap for a bib. 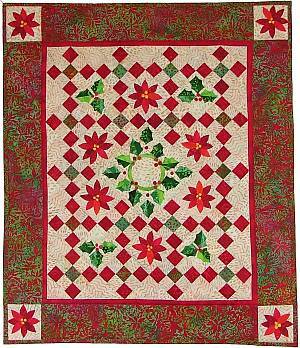 The bib and color step-by-step directions make this project easy and fast. 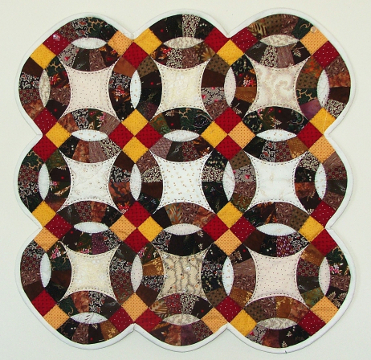 This 46" X 46" quilt can be made larger by adding more blocks. 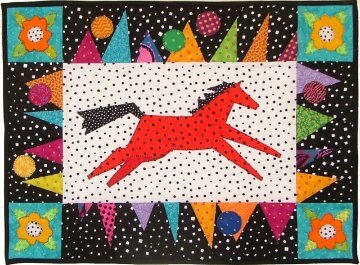 This size makes a great baby quilt. 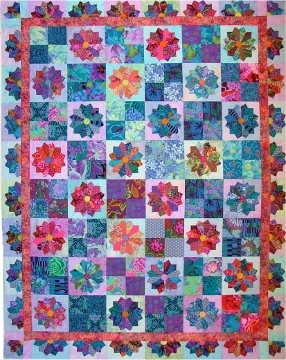 Make this 26" quilt with 2 1/2" strips. The acrylic plate template is included. 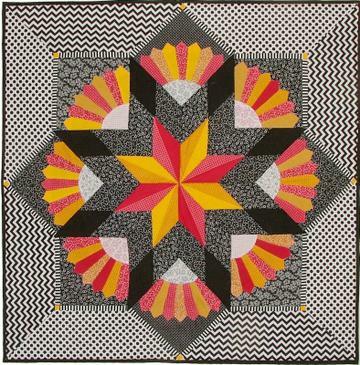 This 46" X 46" quilt features the new color wheel spectrum and black & white batiks by Virginia Robertson for Clothworks. 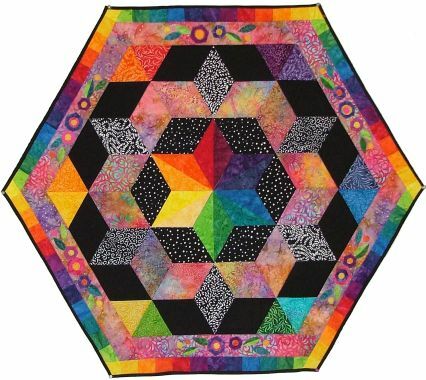 The hexigon quilt could also be the center of a larger quilt. 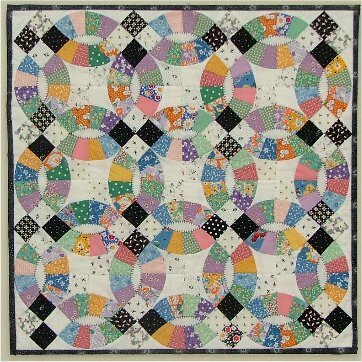 The background is pieced so you can use up all your scraps when sewing this wedding ring quilt. 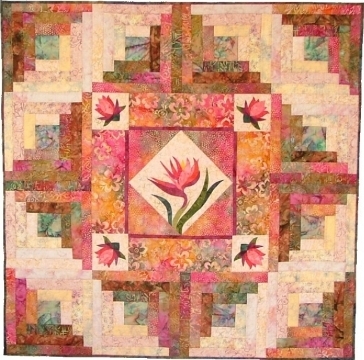 The 40" wall hanging may be made larger by adding more rings. 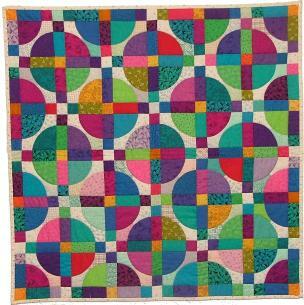 The sample quilt measures 60 inches by 60 inches but you can add extra rings to create a larger quilt. 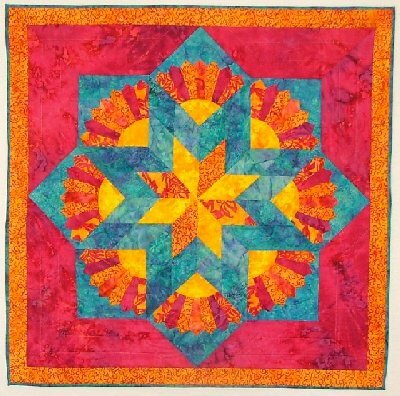 The cover quilt is made from batiks in a glowing range of values. 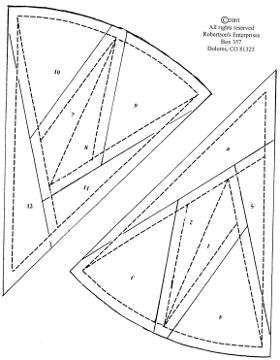 The "pattern includes the template designs that may be traced to plastic. The optional acrylic template set of four includes a wedge, a corner and 2 background acrylic templates. The large side template is not available in acrylic. 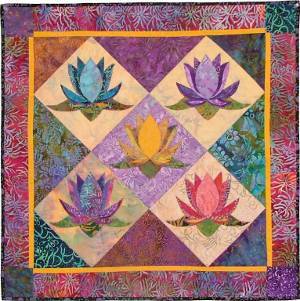 The see through foundation papers are included for a 50" X 50" quilt. 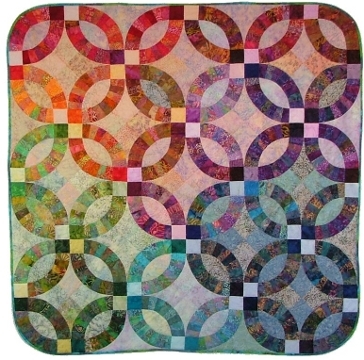 Order more papers and add extra circles for a larger quilt. The Acrylic templates for the background are also an option. 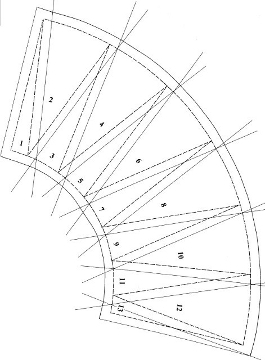 The Acrylic templates also come with a pattern (and templates) for the Old Fashioned Wedding pattern. 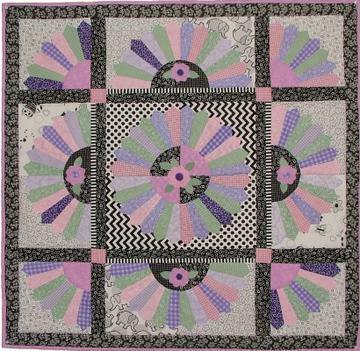 The see through foundation papers to make this 72 1/2" X72 1/2" are included in the pattern. 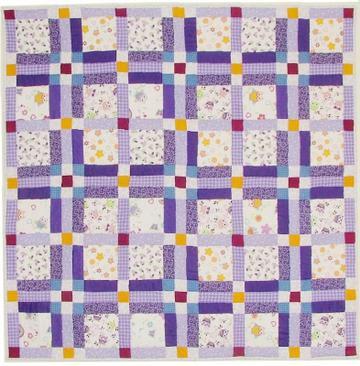 Create this 20" mini quilt from 2 1/2" strips. The see through foundation papers are included. A set of acrylic templates is also available. 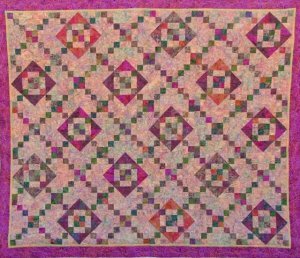 This 35" X 35" pattern includes foundation papers for the compass and corner spike blocks. 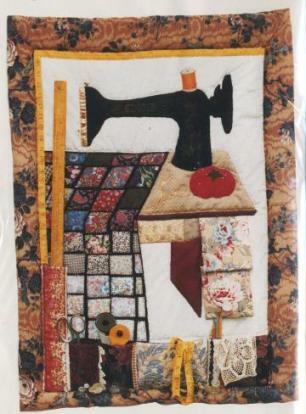 The sample quilt is made from batiks. 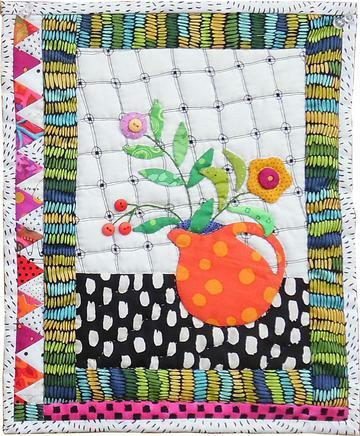 Use giant Dill buttons and ric rac to create this 30" X 30" wall hanging. 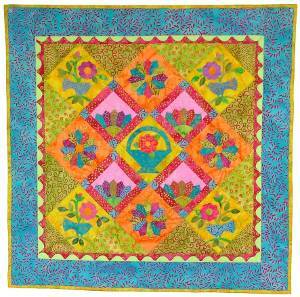 The sample is made from bright batiks designed by Virginia Robertson. 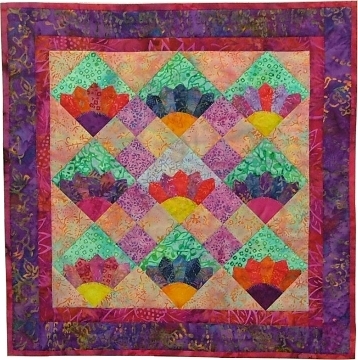 This 60" X 60" quilt is created from the Hot & Hip batik collection by Bali Fabrics. 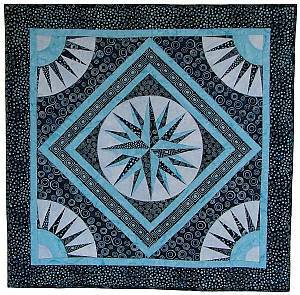 The 14 1/2" X 29" place mat and 14 1/2" X 56" table runner samples are created from the Mood Indigo batik collection by Bali Fabrics. 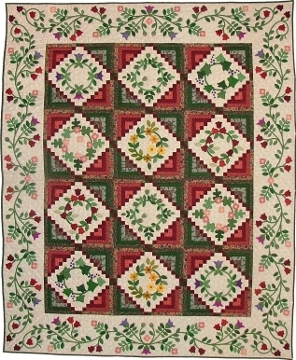 �Dresden Plate Table Runner Pattern is� 15" X 56". 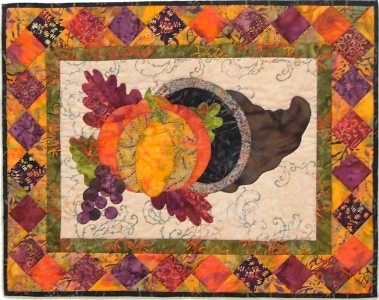 This 76" X 91"� Crossroads Quilt is created from Bali Fabric batiks. 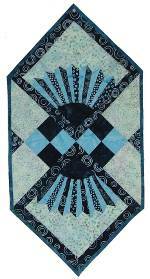 The rose and teal graphic batiks would make a great boy's quilt for a dorm room or graduation gift. � Click here for options. 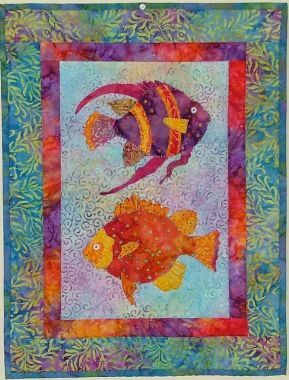 New Coral Reef quilt featured in the Summer Fabric Trends Magazine.� This is the pattern with Tear Away Triangle Papers.� Click here for the the Queen Sized Kit. 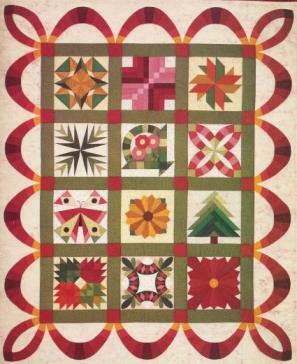 This is a Queen sized Quilt Pattern. 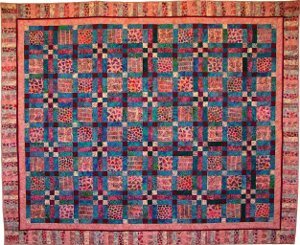 The Chimayo Dinner Party is 75" X 95". 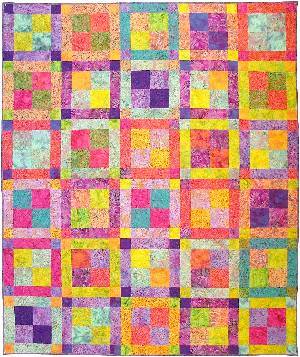 This queen sized quilt is a block-of-the-month project. It is on sale this month for half price! The regular price is $25. 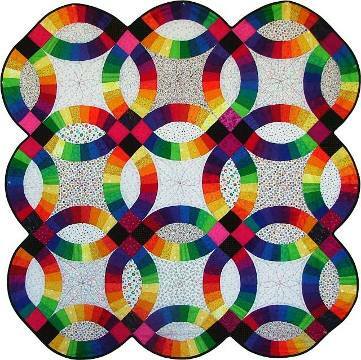 This 24" X 24" mini quilt pattern includes the acrylic template for the fan. 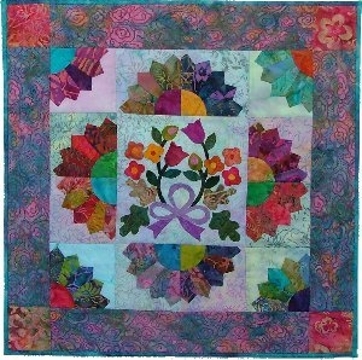 The sample is created from batiks. 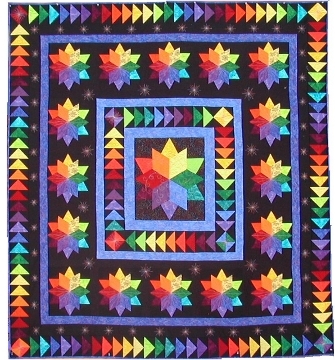 There are three sizes of blocks included in the pattern. 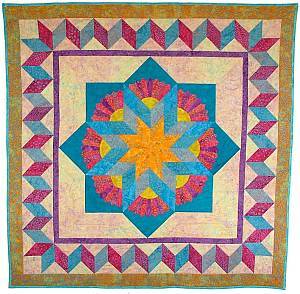 This quilt pattern includes the acrylic template for the fan. 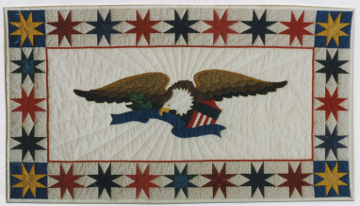 This 44" quilt pattern could be used as the center of a larger quilt. Order the diamond and fan acrylic templates.� Click here for options. 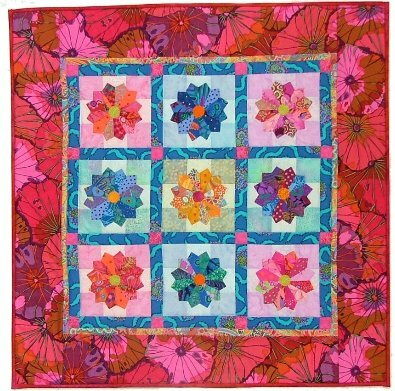 There are enough see through foundation papers in the pattern to make a 45" wall hanging. 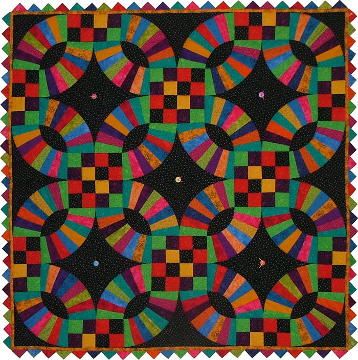 Order more papers for a larger quilt on the last page of this quilt section. 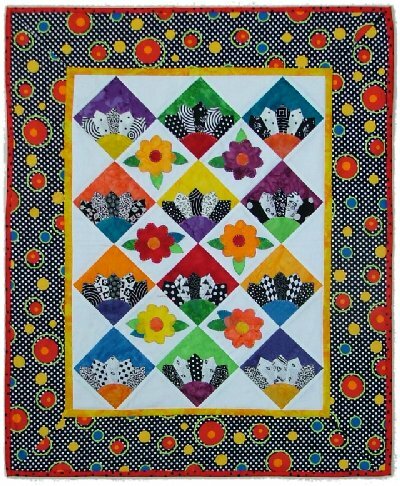 Use 2 1/2" strips to create this 26" mini quilt. The acrylic fan template is included. 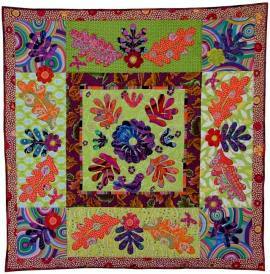 The sample is created from batiks. 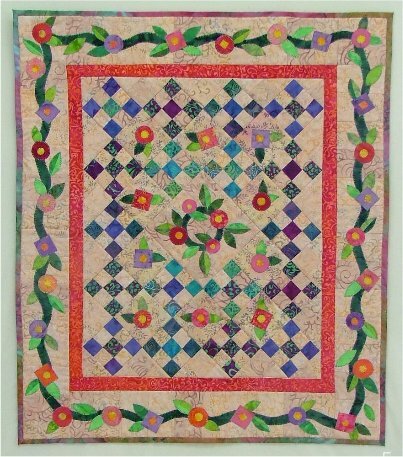 This quilt is 30" X 54" and features applique and piecing. 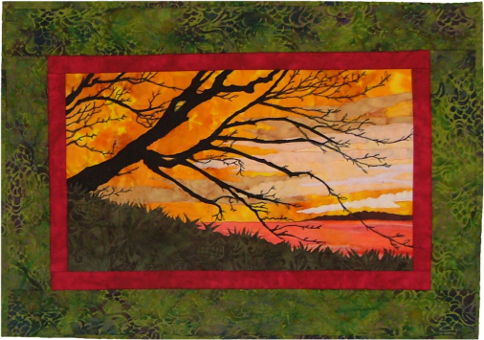 This landscape quilt is 14" X 22" and is created from batiks. 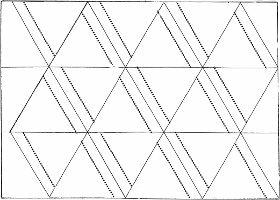 The grid pages makes quick work of the Half-A-Square triangle blocks. 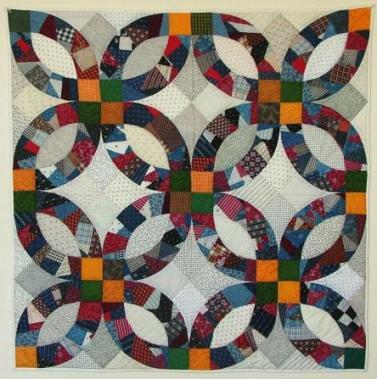 Place the grids on the fabric. 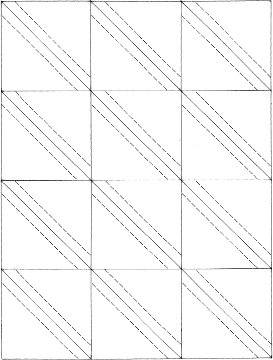 Sew through the paper grid and fabric. 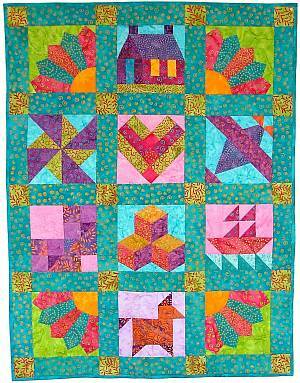 When all the sewing is done, cut the blocks apart. 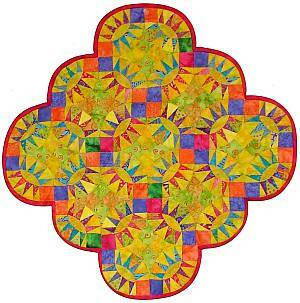 Great for use with the rotary cutter. 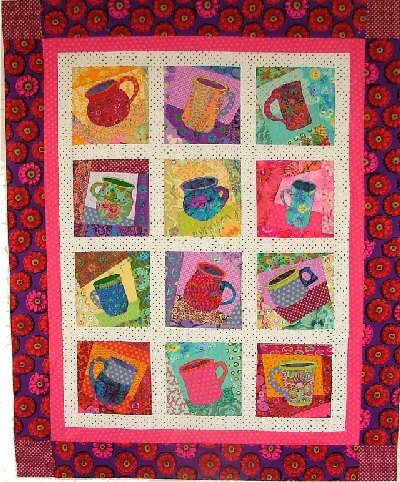 There are nine sizes of blocks. 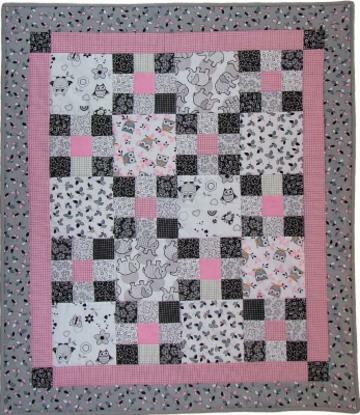 Order the finished size of the half-a-square block. 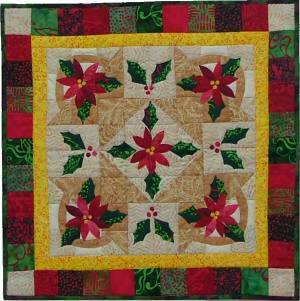 The 1/4" seam allowances are included. 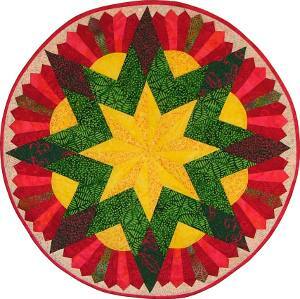 This package contains 40 extra paper foundation arcs for piecing a miniature pickle dish quilt. 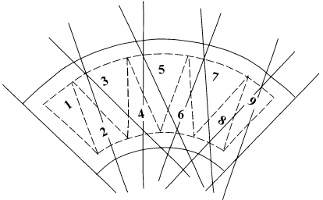 The Mariner's Compass Refill papers include the four sections to create a compass and corner four arks.